I’m crazy about Mexican culture – the vibrant colors, the lively folk art, the mouth-watering food. Which is why if it were up to me, I’d declare Cinco de Mayo a national holiday. Let’s eat and be merry all day long! In honor of this festive and colorful celebration, this week I’m featuring the invitations I created for Anne Nosko, a bride who was planning her big day on the beach in Cabo San Lucas. My team and I chose a palette that mixed bright pink and orange with a beige that alluded to the sandy backdrop where Anne and her fiancée Daniel were getting married. We also had fun creating a crest for the couple: a little Mexican folk bunny carrying the American flag (symbolizing the bride) standing back-to-back with a regal lion holding the British flag (for the groom). I like to think of it as a dash of whimsy signaling the fun that was to come! To show you exactly how I like to spend my Cinco de Mayo, I invited a group of friends from work and beyond to capture my favorite aspects of the holiday, below. 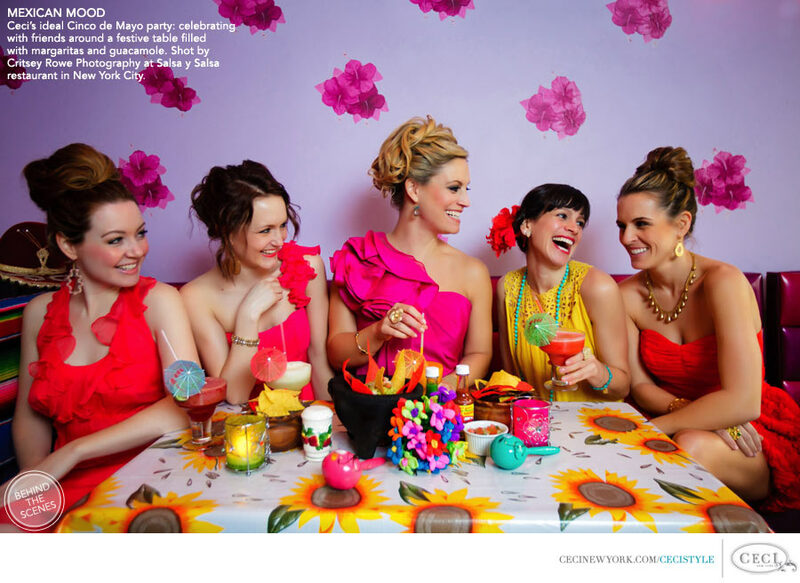 Note the plentiful margaritas and the copious splashes of bright orange and pink! This week’s Get the Look also has a ton of ideas to get you in a celebratory mood. Plus, look for priceless tips on planning a destination wedding in Mexico from Alison Hotchkiss of AE Planning and Design, and Mexican-style entertaining ideas from creative chef Fany Gerson and events queen Karen Bussen. Finally, don't miss out on this week's special giveaway, which is loaded with fabulous gifts and rare discounts from all the experts featured in this issue (valued at over $4500!). Now get busy finalizing your party plans. Salud! Photography by Critsey Rowe Photography. View the Creative Team in Behind the Scenes.